Tom Asacker is the author of five critically acclaimed books: The Business of Belief, Opportunity Screams, A Little Less Conversation and A Clear Eye for Branding, groundbreaking books that redefine business for the new, customer-controlled economy, and Sandbox Wisdom, a heartwarming story about a CEO’s search for meaning and success in the world of business and work. He is a recipient of the George Land Innovator of the Year Award; he holds medical patents and product design awards; and he is recognized by Inc. Magazine, MIT, and YEO as a past member of their “Birthing of Giants” entrepreneurial executive leadership program. Tom holds a degree in Economics and Business Management, and lives in the great Northeast. 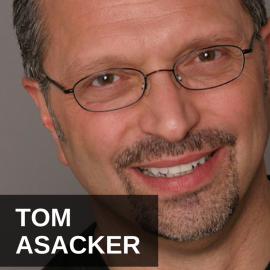 Visit tomasacker.com to learn more.